“Europe is not a continent, it’s an idea, a vision of the world.” When he accepted the European Theatre Prize in 2007, Canadian director Robert Lepage could have been quoting Robert Schumann, whose proposal in May 1950 became the foundation for the European Union. Fifty years later, the issues have shifted from preventing war to protecting the economy, but the goal of cooperation remains. One of the many projects created and funded by the now 27 EU countries, the European Theatre Prize, recognises work that bridges European borders. In April, the 14th Prize was awarded to German director and European icon Peter Stein, in St Petersburg, Russia’s imperial “window to the west” itself a city of over 80 theatres. The event was attended by a few hundred journalists, directors, actors and VIPs from all over the continent, with only two things in common: interest in theatre and a general lack of ability to speak Russian. Or Icelandic, Finnish, Czech or Portuguese, which is where the winners of the festival’s other award, “New Theatrical Realities”, hailed from. Thanks to subtitles, the language barrier was generally not a problem. Instead, this year’s festival highlighted differences between cultural references and theatrical vocabulary. Telling a good story – whether you’re Irish, French or Russian – relies on tapping into some common fibre of truth, like most arts. Look at Ireland’s rich literary and theatre traditions which have certainly crossed borders, despite being the westernmost country of Europe – or perhaps because of it, thanks to the far-flung Irish diaspora. Who is not familiar with the works of Beckett, Shaw, Joyce, Stoker, Wilde, Yeats? Then there’s Iceland, on its way to join the EU. With a population of only 300,000, theatre flourishes: three out of every four Icelanders are regular theatregoers. Vesturport director Gisli Orn Gardarsson described his island as “small communities with big potential”. In St. Petersburg, Vesturport won a New Theatrical Reality prize for their originality and innovation, displayed in a brilliant production of Kafka’s “The Metamorphosis”. With music composed by Australian Nick Cave and a stellar, crawly performance by Orn Gardarsson, the satirical performance focused less on the reflections of the salesman-turned-cockroach, and more on the reactions of his stiff-upper-lipped British family. Vesturport also performed their rock ‘n’ roll version of “Faust”, set in a nursing home with a Mephistopheles surely inspired by Beetlejuice, one of Tim Burton’s creatures. 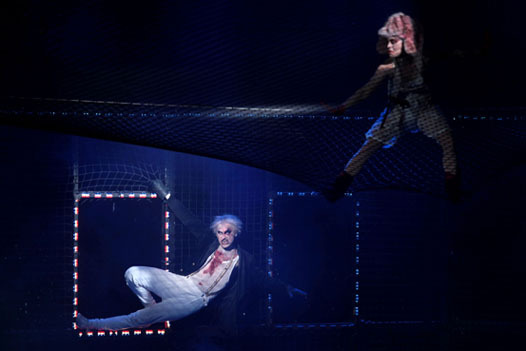 The frenetic energy and overhead action on a net were thrilling, yet some of the critics complained that the company sold the soul of Goethe’s classic tragedy for mere pop-fizz entertainment. Fun it was, but did its youthfulness transcend boundaries? The same question was asked after Finnish director Kristian Smeds’ startling and sparkling production of Paul Auster’s “Mr. Vertigo”. This 3-hour play challenged different forms of borders, literally as the audience is seated together on a revolving circular platform, then mentally as the protagonist heroically – and comically - struggled to learn to levitate and fly; but also linguistically, since the script was entirely in Finnish, with no supporting subtitles. The language barrier is one thing, the intellectual wall another, a kind of old-guard vs. young guard. For instance, the renowned director Lev Dodin’s production of Chekhov’s “Three Sisters” got a 15-minute standing ovation by the critics at the Maly Theatre, and it wasn’t clear whether the applause was for the production or its significance. It was well acted and the set was inspired, but for those theatregoers less informed, who didn’t appreciate the mix of Dodin, the Maly Theatre and Chekhov, it was a lethargic interpretation of an already dreary masterpiece. But then, who wants theatre to be just entertainment, or always high art? The festival organisers, the European Theatre Union, have an inclusive mission, after all. They introduced a couple of new projects that tap the thorny immigration question under the theme, “My Neighbour, My Enemy”. A festival called “Emergency Entrance” - as opposed to emergency exit - in January in Graz, Austria, highlights Europe’s recent response to refugees after the civil unrest in northern Africa and the Middle East. A second theatre festival, “Liquid Frontiers”, next April in Moscow, hopes to give immigrants their voices through theatre, providing an avenue for self expression after fleeing repression.